With the wealth of arts opportunities around the Queen City, this week’s lineup will not disappoint. So get out your calendar and work some of that entertainment into it. concert:nova — "Carnival of the Animals"
The original music by Camille Saint-Saens is a staple among pieces programmed for children. For this performance, concert:nova has commissioned 15 short "animal" compositions — contemporary musical representations of these creatures. All will be brought to life by dancers from the Cincinnati Ballet. Playhouse in the Park —"Ain’t Misbehavin’ "
This champagne reception followed by a gourmet luncheon gives you a chance to wear your favorite hat or an excuse to go buy one! The Women’s Committee has raised more than $700,000 for the park to be located between the stadiums, and the group is announcing a new initiative. Taft Museum of Art — Evening in the Garden "A Crystal Celebration"
Enjoy dinner by the bite, wine and champagne surrounded by spectacular table settings and floral arrangements, plus the opportunity to purchase works of well-known local artists. Tickets are $75 and reservations are required. 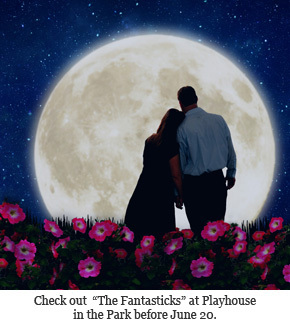 Playhouse in the Park — "The Fantasticks"
This longest-running musical of all time is an intimate, timeless, allegorical tale of forbidden, youthful love and the perspective provided by maturation. It will run through June 20. 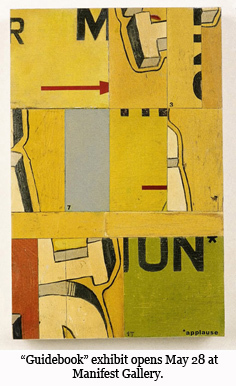 Clifton Cultural Arts Center — "Old School"
In his abstract paintings, Californian Fritz Chestnut, references waves, moving water, outer space, mudslides and molten lava. Part psychedelia, part color-field painting, he marries surfing zen with modernist abstraction, yielding a distinct California feel with saturated and sometimes garish fluorescent colors. This is the last day for this show! Mariemont Players — "The Dixie Swim Club"
Cincinnati Pops Orchestra — "Pop Goes Vegas"
Editor’s Note: "Express Picks" is Cincy Chic‘s newest column. Columnist Thom Mariner is the publisher of Express Cincinnati, a free local print and online publication dedicated to the promotion of arts and philanthropy, so each week he will share his picks for the best events in the Cincinnati area. If you have ideas or suggestions for "Express Picks," e-mail info@cincychic.com. Cincinnati Opera — Redux Public Performance Series "Bohème"
If you’re curious about opera, but short on time, here’s an opportunity to get up-close-and-personal with a 50-minute version of Puccini’s beloved "La Bohème"
Ensemble Theatre — "The Marvelous Wonderettes"
This is your final chance to see this extremely popular show — extended two weeks via popular demand. The New York Times best-selling author and Cincinnati native reads selections and signs her novels, American Wife, Prep and The Man of My Dreams. 7-10 p.m., $10 per person in advance or $15 per person at the door, Moonlite Garden/Coney Island,. Opera in Cinema — "L’Orfeo" by Claudio Monteverdi One of the earliest works (1607) identified as an opera, this recorded performance of the Orpheus story is from the legendary Teatro alla Scala in Milan. The oldest choral festival in the Western Hemisphere presents a concert honoring and featuring conductor Robert Porco and his 20-plus years of preparing the May Festival Chorus. Experience exciting, accessible music by Leonard Bernstein and William Walton, plus a world premiere commissioned by the singers. May Festival — "Season Finale"
This concluding concert will feature a grand-scale Russian opera by Rachmaninoff and Mussorgsky in addition to the spectacular choral version of Tchaikovsky’s "1812 Overture." Exhale Dance Tribe — "Going… (Now)here"
Expressionistic and multi-lingual dance that is rooted in rhythmic language and storytelling features diverse and versatile performers. Contemporary Arts Center — "The Event"
A gala street party will spread throughout the Backstage District with artist Shepard Fairey taking a turn as DJ. Cincinnati Ballet and ballet tech Cincinnati — "Cultures of Dance"
This collaboration highlights the commonality of movement in various dance cultures and the timeline from ancient to modern dance styles. For a full listing and preview of upcoming arts and philanthropic events, as well as photos from past events, visit ExpressCincinnati.com or pick up a copy at hundreds of locations where you work and play.